It’s February, but I’ve got Summer on the brain. The very first February I was eating low fat vegan, I spent a lot of time contemplating what desserts I could make because I was so thrilled to learn I could make them all fat free. Among my first favorites were Susan’s Skinny Figgy Bars. During one of these day dreams, I was interruputed by this thought coming seemingly out of nowhere: a mental gasp, and then: “I”ll never eat another drum stick again! !” By this I did not mean a chicken leg, but that old school ice cream confection known as a “drumstick.” Since I hadn’t eaten one and hadn’t wanted to eat one in years, the thought struck me as so funny that I laughed out loud at myself for several minutes. I know I’m dating myself, but Summer mornings in the hot Sacramento Valley revolved around waiting for the popsicle man to round our corner. Us kids would lounge in the shade of a tree or on someone’s porch, studying the cracks in the cement, teasing along a desultory argument about how to spell “photosynthesis” or who was better, The Beach Boys or The Beatles (in those days, I always voted for The Beach Boys no matter who else they were being compared to). When the truck became visible, our lethargy dispersed without ceremony–and so did we kids—speeding home to ask for quarters and dimes to buy fudgicles, 50-50s or cherry bombs. When I had a little extra change, my favorite was a drumstick. I loved the contrast in textures and tastes between the crunchy nuts and cone, the dark chocolate and the creamy vanilla inside. A snowy evening sitting in front of the fire 50 years later is a strange time to recognize the taste of a long lost summer dessert treat I was sure I would never eat again has indeed come back to me. But there it was, right in my bowl. What a surprise to discover I had somehow morphed my banana ice cream into a melting drumstick dessert! Some of the things I eat and love the most are so simple I don’t think of them as recipes. They are serendipitous surprises I stumble upon that delight and comfort, and help me keep it simple and whole, so I can stay happy and keep getting healthier. So here is my whole food, fat free, gluten free, soy free vegan version of a melting drumstick. My beloved buckwheat groats double as a low fat unprocessed alternative for cone and nuts, but if you find a vegan gluten free cone that works for you, I see no reason why you couldn’t put this into one. Add banana to food processor, along with vanilla and almond milk. Let it sit a few more minutes. Then whir it up until it’s soft serve consistency. Meanwhile, in a small dish measure out the heaping teaspoon of carob powder. (If you can do cocoa powder, use that. But dark or medium carob powder is truly heavenly in this.) Add a scant teaspoon of date syrup. 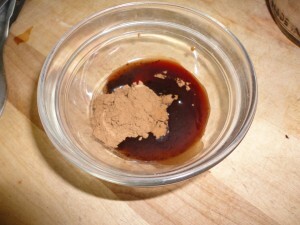 (You want slightly more carob powder than syrup.) Then add about a teaspoon of water. 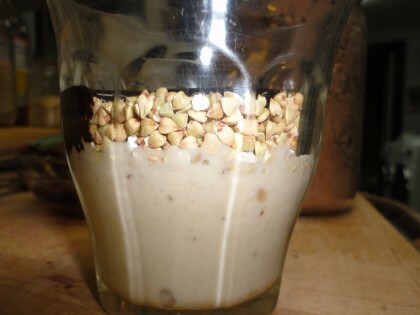 Scoop your “ice cream” into a glass or small bowl. Cover with the raw buckwheat groats. Drizzle the carob syrup over the groats. Enjoy the sweet and dark contrasts swirled into the crunchy kasha. Lick the spoon, and even the dish, if you want, like you’re a kid again. But with a clear conscience. Healthy Happy Valentine’s Day Everyone!! Should the buckwheat groats be toasted? I’ve got a big jar of raw buckwheat but I thought they needed some sort of soaking or toasting to become edible. Great recipe, Maria! I had no idea you could eat buckwheat groats raw! Yours look much lighter in color than the ones I have. Do they come in different varieties? Thanks, my 12 year old was just telling me today he missed drumsticks!!! His birthday is this weekend, he will be thrilled. Don’t you cook the buckwheat first? Our co-op carries both toasted and raw kasha in bulk and in trying not to eat as many pre-toasted foods, since they are hard for me to digest, I discovered, much to my delight, that I actually I prefer the raw ones. This way when I’m going to cook them I can toast them very lightly if I want to, but I have control over how “done” they get. The groats in this recipe are just raw. I first started experimenting with using them as “sprinkles” on top of pancakes cooking, instead of using sunflower seeds. I discovered that they are not that hard and quite crunchy like other nuts and seeds (they are actually a seed, not a grain). Then I experimented with adding some to my Esselstyn style bowl of oats, almond milk and fruit in the morning, and never looked back. They soften almost immediately once moistened, or enough to eat and chew them like a seed or nut. And they are fine for my finicky digestion. I’ve never tried the toasted or cooked groats in dessert. But I’m assuming they would work. They might have a little more crunch, like the raw ones do when cooked on the surface of a pancake. I suppose whether the “sweetness” of the raw ones is more or less after toasting depends on the toasting and the person who is tasting them. Please let me know if you try toasted ones. But if you can find them, I love the raw ones. love this recipe…. I will be trying it out soon! this sounds wonderful, and I love my banana ice cream, so adding all of this is heavenly ! Thanks, carollynne!! So glad this sounds heavenly to you! What wonderful memories today’s message brought to mind! We moved (from Castro Valley, CA) to Stockton, CA the day I turned 9 and I, too, fell in love with Drumbsticks! Stockton’s weather was pretty hot in the summer (112 degrees the day we moved in), and I just had to have ice cream each day. My friends and I did similar things to you but we were pure Beatle maniacs! My folks even got me tickets to see them perform at the Cow Palace (in SF) when I was 16! What a wonderful b-day present that was! I can hardly wait to make your drumbsticks – THANK YOU! Hi Marcia–wow, we were “neighbors,” loving drumsticks about 50 miles apart! Loved reading your memories. You’re welcome! Hi Donna, you’re so very welcome. I am always honored to hear from a successful “veteran” like you. All you write here makes me so happy. Really glad you are enjoying the buckwheat groats. Your words inspire me to keep on!! Thank you! The ones called “kasha” are by definition toasted buckwheat, at least in American English (per Wikipedia: “The word in modern American English is commonly restricted to roasted whole-grain buckwheat or buckwheat groats. It is a common filling for a knish.”) That is likely what you have Susan. I buy raw buckwheat in the bulk bin at Whole Foods and it is much lighter in color. I have never tried to eat it without cooking it though. What a fabulous idea! Hi Caroline, thanks for this clarification. I didn’t know the term “kasha” was commonly restricted to the toasted groats. And yes, the ones I get in bulk at my co-op, which are alongside the toasted ones, are much lighter in color. To me, they “crunch” at a similar consistency as something like grapenuts cereal. Thank you, Maria! For another brilliant, amazing idea! Your words have the ability to transport us all back in time and take a clear-as-day look at those moments of simple pleasure from the past. I think you’ve definitely got us all missing the days of the ice cream man, and the summer! In the neighborhood I grew up in we had the paletero man. He would come through with his cart on the front of his bicycle in the hottest part of the afternoon and all us kids would jump up from our play and spend our allowance. His name was Magdaleno and he was quite old but did this year after year and was part of the community. We were all poor, and so was he, so if a kid didn’t have money one day he would often give them a paleta for free and eat one himself, sitting in the shade of the orange tree with us. He would always get special packages of tamales from all the families during the holidays and extra produce and eggs from our gardens too. Everybody loved the paletero man! Perhaps our parents remember kind old Leno and the paletas from their youth when he was also a much younger man. Thanks, Nicole. Your “Holy Cow” made me laugh in the best kind of way! Just made this tonight for a birthday celebration. My daughter and I couldn’t believe how delicious it is! Very creamy, rich and satisfying. We will definitely be making it again (and again and again….)! Hi Cathy! I am so happy to hear that you and your daughter enjoyed this! Thanks so much for this lovely comment. You made my evening! I’ve been wanting to try this for a while now and finally made some date syrup this past weekend. Well well well! This is delicious!!! 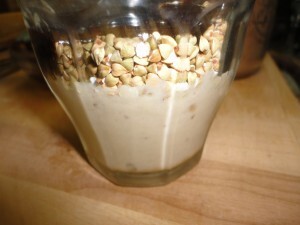 When I read this recipe I had no idea you could eat buckwheat raw and it is sooo good! I’m putting it on everything now. LOL. Although the first bites are definitely frozen banana, it does tone down into the ‘drumstick’ flavours of my youth. VERY tasty. It’s going in the book. Thank you for so much. Surrey, BC. Hi Joan! Thanks so much for this delightful comment, I smiled more and more broadly the farther I read on into it! I can certainly relate to how much fun it is to discover raw buckwheat groats! I love your description of how the dessert “tone[s] down into the ‘drumstick’ flavours of [your] youth.” I’m so glad you like it. You made my evening!